Want to try a class, to see what it's about ? Consider what your body needs and what you want to achieve. We aim to create Pilates programmes that deliver tangible results within 12 weeks. From reducing back pain to toning the body (flat abs + sculpted bum! ), our programmes are focused on getting you to achieve your goals. After all, if you know what you are aiming for, then it’s that little easier to stay on track. And with commitment, results will follow. We also run 7 DAY PILATES CHALLENGES - a great way to try out Kalm Pilates and get to grips with the technique in just 1 week! And as part of the challenge, you can connect with Sarah via email, messenger or via group call to discuss your health issues and fitness goals. Are you ready to give it a go? Sign up for our programmes or challenges here. Who is Kalm Pilates aimed at? It's aimed at YOU, because Pilates will help improve pretty much anyone's body. It is the most targeted workout we've come across and one that can easily be maintained - and being consistent is so key in getting results. In our classes - offline and online - we get both men and women of all ages becoming Pilates pros with our guidance. You don't have to have any previous Pilates experience - our teaching method is perfect for absolute beginners too! And if you have any other questions, please don't hesitate to contact us on [email protected]. Kalm Pilates offers online programmes with a very personal touch. We are here to help you achieve your goals and you can connect with Sarah – your teacher and coach– whenever you need. Have questions about certain exercises? Want to discuss your back issues in more detail? Want advice on how to improve your technique? No problem! 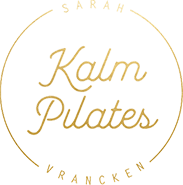 Sarah will be your personal coach and you can connect with her via the Kalm Pilates Facebook Group, set up a one-to-one consultation or join a group call – and of course, via email and FB messenger. Each month, you get a combination of new and repeat classes to create a workout schedule that is focused on helping you to improve and get a step closer to achieving your goals. Once you have signed up, you will have access to your own personal page where you can find your weekly videos. All you have to do then is to roll out your mat, press play and enjoy the class. If you can't keep to the schedule, don't worry - we currently offer all our member LIFETIME ACCESS (amazing, right?). This means your classes stay present on your page - even after the 12 weeks - and you can do them in your own time, but we recommend to stick to the 3 x 30min a week schedule to see great results within 12 weeks. Expect it to be challenging, but in a good way! Want to find out what people are saying about the Kalm Pilates programmes? Have a read here and discover what you can achieve within 12 weeks by joining one of our programmes.